New science and technology could significantly enhance the wellbeing of the bottom half of the world’s population. All too frequently, however, innovations intended for the 3 billion people who live on less than $3/day are not used because they are not context-appropriate. Often this is because such innovations are devised by people in developed countries who have little understanding of the daily lives of the people for whom the innovations are intended. There is a burgeoning interest in Technology for Development (T4D) in Cambridge, and some very promising innovations are being evolved. To help Cambridge innovators avoid the trap of evolving technologies that are not context-appropriate, the Winton Programme for the Physics of Sustainability, together with the Smart Villages Research Group and the Cambridge Malaysian Education and Development Trust, funded six T4D Travel Awards of £6000 each. The awards enabled University of Cambridge graduates and early career researchers to develop and test their T4D ideas in real developing world situations. The T4D Travel Award training and support programme was delivered by the Centre for Global Equality (CGE), a Cambridge-based not-for-profit that enables the evolution of innovative solutions to global challenges. CGE, which facilitates collaborations between the public and private sectors, academia and civil society, co-founded and co-directs Cambridge Global Challenges, the University of Cambridge’s Strategic Research Initiative for the UN Sustainable Development Goals. The T4D Travel awards are part of the Centre’s Inclusive Innovation Programme, which includes Development i-Teams and the CGE Global Goals Innovation Cultivator. Graduates and postdocs based at the Maxwell Centre participated in two of the six T4D projects. Bang Ming Yong and Tianheng Zhao went to Malaysia as part of Project AUVR to investigate how virtual reality technology could enhance care for autistic children. 1-2% of the world’s children are identified with autism spectrum disorder, which impedes the way they think, communicate, socialize, and learn. Early interventions have shown to be effective, but treatment is very expensive as it requires many contact hours with trained specialists and dedicated facilities. Developing countries like Malaysia have a severe shortage of experts and resources, making provision of such interventions particularly challenging. The estimated number of autistic children in Malaysia is 80000, only 1500 (<2%) of whom are catered for at any given time in the country’s twenty autism centres. Project AUVR’s proposed solution was to develop a reconfigurable and smart software platform using recently developed virtual reality headsets to digitize the tools and environments for interventions. This could lower the costs of delivering interventions and improving accessibility because the functionality of virtual environments can be customised easily and cheaply using software. Another T4D team developed and tested a Soil Moisture Sensor to assist small holder farmers to irrigate more effectively. Mike Price and Viola Introini went to Ethiopia to collaborate with colleagues at the Bahir Dar Institute of Technology on developing an improved wireless soil moisture sensor and assess the potential for using moisture sensors in East Africa. Working with Hydrology students they conducted 10 interviews and meetings with hydrogeological experts, local small-holder farmers and agriculturalists across four irrigation schemes with different soil types in the Amhara Region near Lake Tana. Through the fieldtrip they gained valuable insights into local farming and watering practices. Although presently relatively little land is irrigated in Ethiopia, irrigation is increasing to meet the food security needs of a large and fast-growing population. There is an urgent need to enhance water management as irrigated crops presently suffer from overwatering at early development stages and underwatering when more mature. Soil moisture sensors could contribute to solving this problem, but the team found that presently it is not feasible to produce a sensor that would be affordable for smallholder Ethiopian farmers. The team is therefore developing a new sensor for government agencies and researchers that would reduce the cost of soil moisture data collection and data upload and management. The other four T4D teams co-created new technologies elsewhere in Africa. The plastic upcycling team explored the conversion of waste plastic into building materials as an income-generating activity for a local Community Based Organisation in Kilifi, Kenya. 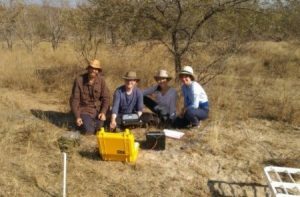 Exploring a new use case for ApRES, a radar instrument originally developed by the British Antarctic Survey, the team conducted a field trial in Kruger National Park, South Africa, to investigate the instrument’s potential for monitoring the water table and enhancing ground water management in arid areas (Graphic 2). Blue Tap tested the performance of their chlorine injection technology on household water supply in Mbarara, Uganda. They also assessed the feasibility of their business plan, including gauging local plumbers’ interest in their product. Majico tested the first full scale prototype of their photocatalytic water purification device in in Dar es Salaam, Tanzania, and co-created a business model with students from Ardhi University.